Way back at the very end of last century, golden oldies Jenny Stewart and her husband Hilton set off from their home on Waiheke Island for tropical holiday in Fiji. Little did they know this was to be the start of a foodie adventure that would last well over a decade. Once back from Fiji, Jenny was determined to cook with the tamarind fruit she had encountered there. After experimenting with a little bit of this, and a bit more of that, she created a superb chutney. Friends told her it was too good to keep to herself, and that she should be selling it at the Waiheke Island markets. One thing lead to another, and before long she and her Tamarind Chutney had become 'World famous on Waiheke'. 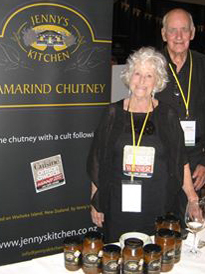 A few years later, someone suggested that Jenny enter her chutney in the Cuisine Artisan Awards which celebrate fabulous NZ artisan foods. Those who had tasted it, were not surprised when the Jenny's Kitchen Tamarind chutney (Medium) won a Cuisine Artisan Award in 2012. Jenny was 80 when she won her award. 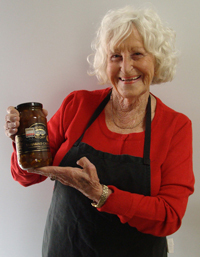 As the NZ Herald wrote in 2012 "It's hard to know what is more delightful, Jenny's Kitchen Tamarind Chutney or the charming octogenarian couple who produce it all - by hand". While Jenny no longer stirs the pots, her legendary influence and secret recipe lives on in her award winning tamarind chutney. It was in the late 1990’s that Cathy Knight and Grant Hunter discovered their secret treasure on Waiheke Island. It was more than the gorgeous rocky island, with beautiful beaches, with a climate perfect for growing some of the best wine in the world. It was more than the charmingly artistic, bohemian and environmentally aware community who lived on their perfect island. For Cathy and Grant the real gem was found at the Ostend market. Tucked away inside the hall, they discovered a lovely older lady called Jenny selling her divine chutney made from Tamarind. They were hooked, and from then on, all future visits to the island required a trip to the market to buy more chutney. In 2014 Grant was looking to make a change, and quit his corporate lifestyle. His secret ambition of months of long leisurely walks, and endless coffees while contemplating the next step came to a screaming halt, when only a week or two after departing the multinational grocery industry he spied a little trade me advertisement. The Jenny’s Kitchen Tamarind Business was for sale. As the sale of the business was promoted nationally on radio, there were over 50 interested parties, with Jenny and Hilton carefully vetting them all for suitability. This business wasn’t for sale simply to the highest bidder, but to the one who would also respect, nurture and develop this very special product range. Jenny and Hilton were confident their business was in safe hands with Cathy and Grant, who besides being addicted to the Chutney, also shared a love of Waiheke Island, and had both grocery industry and small business experience. They passed on the secret recipes, the special measuring cup, and at 82 years old, Jenny and Hilton hung up their aprons. The rest, as they say, is history.